Space Invader badge in white on a black background inspired by the retro arcade game Space Invaders. These retro gamer badges are perfect for those of us more at home in an arcade and using a joystick & always prove popular with our more mature customers. If you are into Retro gaming, either on a console or perhaps on a Sinclair ZX Spectrum, Commodore Amiga or an Atari ST, then be sure to check out the rest of our retro gaming badges on the website. 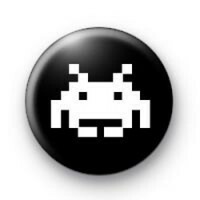 We have a great range of retro geek badges on the site. Space invader alien badge. All of our badges are made by hand in our UK workshop. We deliver our badges to customers all over the world & offer free worldwide delivery on larger orders. We also offer next day delivery on orders in the UK which is available during checkout.